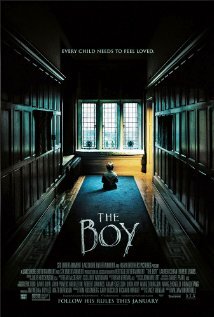 "The Boy" stars Lauren Cohan (The Walking Dead) as a nanny named Greta Evans in this horror/thriller. She is an American woman who takes a job in an English town after leaving home for personal reasons. Little does she know she'll be babysitting not a human boy, but a doll. At first, she's stunned and thinks it's some kind of joke. The parents are serious though and don't like how she is acting so she quickly realizes it's serious. They leave on a trip but before they do the mother says sorry to Greta on their way out. Soon after, Greta notices weird and odd things about the doll. It moves on its own accord but only when no one is around. She later tests it by marking where he is and when she leaves for something and returns he is in a different spot. Greta is creeped out at this point and the only other living person she has contact with is this guy who delivers groceries on certain days named Malcolm (Rupert Evans). He doesn't believe her at first but Greta does her test and then he is in full support. Is it a ghost out for revenge? I would say yes. The doll is only a memory of the parent's son who passed away twenty years ago. Unable to let go, they treat the doll as their child. Sounds crazy, but what can you do? Greta has rules she has to follow or else the doll (named Brahms) will not treat her so nice. He scares Greta on more than one occasion until she realizes she has to follow the rules. When she does, her life is merry. Greta and Malcolm join forces but Brahms' rules state that no stranger should be in the house so crazy things happen.